A New Model for Paying Musicians a Living Wage? The Bay Area nonprofit Jazz in the Neighborhood makes up the difference when venues come up short. 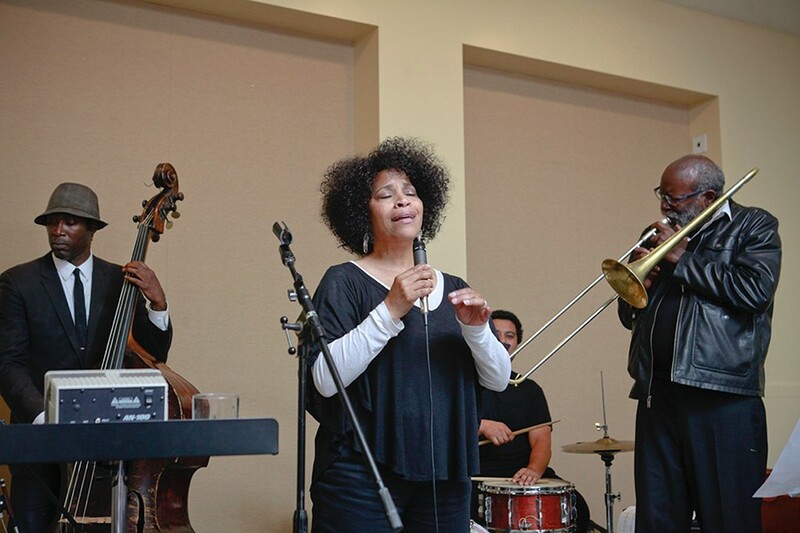 Singer Clairdee, bassist Marcus Shelby, trombonist Wayne Wallace, and drummer Hamir perform at a fundraiser for Jazz in the Neighborhood in 2015. Bay Area trumpeter Mario Guarneri is sympathetic to the plight of freelance jazz musicians. The septuagenarian has a long career performing with symphonies and for television and film, while teaching at various institutions. But in recent years he's seen up-and-coming jazz musicians struggling just to get by. "Most venues don't pay a guaranteed fair wage," he said. "Instead, they offer a percentage of the door, or ask musicians to split the tip jar." If you do the math, he said, "the hourly wages often amount to less than the SF city minimum wage." Underpaid freelance musicians is nothing new. But lack of union support, the Internet's supply of "free" music, and an abundance of talented musicians in a buyer's market have exacerbated the problem. Years ago, Guarneri decided to do something about it — by paying musicians out of his own pocket. But he realized his method was a band-aid approach to a systemic problem. So, in 2012 he created Jazz in the Neighborhood, a nonprofit whose goal is "to improve the economics of jazz performance in the Bay Area by presenting affordable concerts, paying musicians a guaranteed wage, and supporting the work of established and aspiring artists." "Suffice it to say, the music scene as we knew it in the Bay Area in the 1980s and '90s was a very different scene than it is now," said Jon Herbst, a sought-after composer, arranger, and audio engineer who helped Guarneri start Jazz in the Neighborhood. "We saw the whole sort of degradation of the music scene take place and were aware of it. We saw that it was affecting many, many talented players that we knew and were associated with; it hit them hard." Jazz in the Neighborhood took a major step in 2013, becoming a member of the Intersection Incubator, a program of the nonprofit Intersection for the Arts, which allowed it to receive tax-deductible contributions. Jazz in the Neighborhood has presented nearly 200 concerts in Bay Area venues such as Piedmont Center for the Arts, Community Music Center in San Francisco, and Copperfield's Books in San Rafael, paying $140,000 to more than 300 musicians. "There was no tip jar allowed and no splitting-the-door percentage deals," Guarneri explained. Sponsorship comes from a variety of sources: members, grants, corporate and private foundations, local businesses, and ticket sales. Bay Area jazz guitarist Terrence Brewer has performed at several Jazz in the Neighborhood events and was recently named to the group's artistic advisory committee. "I love what Mario is doing," Brewer said. "He has made us realize there is a partnership to be had with young artists and professionals coming together." Last year, Guarneri expanded his efforts further by creating the Guaranteed Fair Wage Fund. A survey of Bay Area jazz venues by Jazz in the Neighborhood revealed that musicians were paid an average of $95 each for a three- or four-hour performance. The fund ensures that musicians earn at least $150 per performance by subsidizing up to 40 percent of that amount after the venue guarantees the initial 60 percent of their pay. During a pilot program last year, Jazz in the Neighborhood supplemented musician's salaries by $2,000 (adding about $60 to each musician's pay) over the course of eight concerts. This year, Jazz in the Neighborhood received a $3,000 grant from the SF Friends of Chamber Music to fund a concert next year showcasing three young professionals who have come through the nonprofit's Emerging Artists programs. The concert will be held Feb. 16 in the SF Community Music Center. While jazz musicians typically haven't had the support of the musicians' union, Guarneri hopes to change that. "The union supports the symphony, opera, ballet and theater orchestras because they bring in revenue to the union through work dues and thus have a strong voice in union policies," he said. David Schoenbrun, president of the Bay Area Musicians Union Local 6, is sympathetic to what he called Guarneri's "noble quest." But he cited several obstacles to revisiting such prosperity. "Patrons once found a value in live music and a willingness to pay for it," said Schoenbrun. "But there's been a cultural shift in the value of music, and people often feel it should be free. That's been a difficulty, and it's sure to get worse." There's also been a shift in the musicians' union membership: Most members are in their 50s and 60s. "We have fewer and fewer young people joining, which was not the case in the 1950s and '60s, when the union could ensure the minimum number of musicians in the room, no matter what kind of music they were playing," Schoenbrun said. "The only young people joining are fresh out of the conservatory and want to play in orchestras, which requires union membership." Younger jazz players are reluctant to join because there is no work for them that requires union membership, Schoenbrun continued. "And they see no reason to expend money on dues if they don't think the union can protect what they're doing." Another element in the mix is the fact that many musicians do club work "as an avocation, without expectation — or hope even — of ever being paid. It's a labor of love," Schoenburn said. This development, he noted, "takes it out of the professional realm. Club owners plead poverty because they don't get enough traffic, and only take musicians who have established a following." Experienced jazz musicians are left to hope that a gig will provide a chance to sell a few CDs. But there may be a warming in the relationship between Jazz in the Neighborhood and the musicians' union. Recently, Guarneri and the Jazz in the Neighborhood staff made a presentation to the union board about his nonprofit's accomplishments. "We're not sure how we can partner together to help musicians, but they clearly appreciate that we've paid professional wages to over 300 musicians and seem to want to help," Guarneri said. For more information, go to JazzintheNeighborhood.org.